What is BART Silicon Valley? VTA’s BART Silicon Valley involves a program of transportation improvements in the corridor that generally extends from the southern boundary of Alameda County in the City of Fremont through the cities of Milpitas, San Jose, and Santa Clara in Santa Clara County. These improvements include a planned 16-mile, six-station extension of the existing San Francisco Bay Area Rapid Transit District (BART) system into Silicon Valley. VTA’s BART Silicon Valley program also includes other related projects and activities required to prepare the rail corridor for BART, such as relocation of existing UPRR tracks and utilities, drainage improvements, and grade separation projects within the alignment that are funded through other sources. VTA’s BART Silicon Valley is being managed by the Santa Clara Valley Transportation Authority (VTA) in cooperation with BART. VTA’s BART Silicon Valley will be constructed in phases. Phase I (Berryessa Extension) is the first 10 miles which includes two stations and Phase II is the last six miles which includes four stations. The Phase I consists of the design, construction, and future operation of an approximate 10-mile extension of the BART system into Santa Clara County. 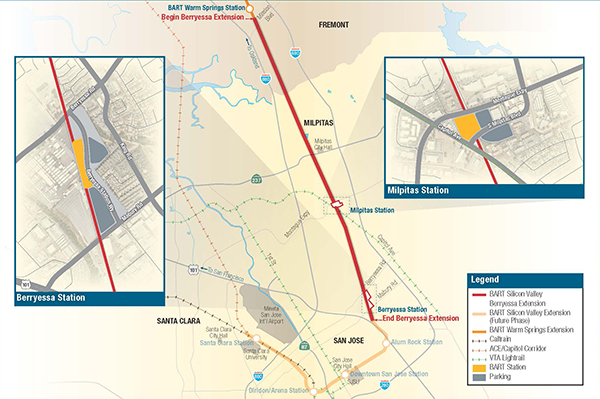 Phase I will connect to the track south of the BART Warm Springs Station in Southern Fremont (opened in 2017) and proceed in the former Union Pacific Railroad corridor through Milpitas to the Berryessa District of San Jose, near Las Plumas Avenue. The alignment is a combination of at-grade, open cut, and aerial guideway configurations, and includes a retained-cut passenger station in Milpitas (Milpitas Station) and an above-ground passenger terminus station in San Jose (Berryessa/North San José Station). The Phase I project scope includes new BART vehicles, VTA feeder buses, 10 miles of double-track grade-separated guideway, traction power substations, high voltage substations, a communication system, passenger drop-off facilities, surface and structured parking facilities, bus transit centers, a pedestrian bridge, real estate acquisition, utility relocation, drainage improvements, environmental mitigation, financing, startup and revenue testing, and other elements necessary for project delivery. The project includes facility additions to the existing BART Hayward Yard (located in the City of Hayward approximately 14 miles north of Santa Clara County) for maintenance of BART vehicles. BART is finalizing their fare and service plan for the Berryessa Extension in the coming months. When Phase I passenger service begins, up to 10-car trains on frequencies of approximately 15 minutes, will be operated during peak commute periods on one BART line. Phase I will continue to be accommodated by one-line until BART’s new train car program delivers a sufficient number of cars to support two-line service, estimated to be in early 2019. 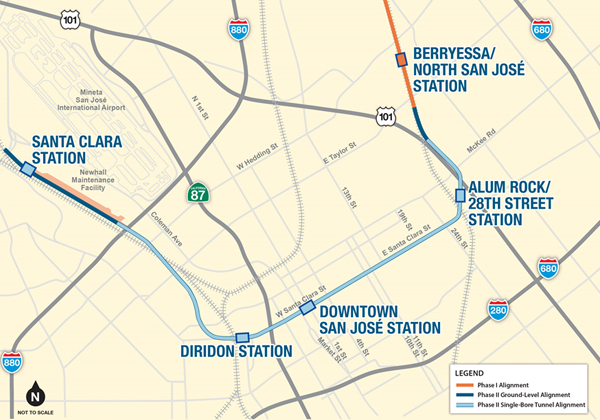 The extension will include light rail intermodal improvements at the Milpitas Station and new high frequency feeder bus service to connect the Berryessa/North San José Station to downtown San Jose and the City of Santa Clara. The projected opening day ridership is approximately 23,000 average weekday riders. Approximately 4,800 parking spaces will be provided to serve projected year 2035 park-and-ride demand. The Phase II Extension Project will include a 5-mile-long subway tunnel through downtown San Jose and will extend the BART system from the future Phase I terminus for approximately six miles to the City of Santa Clara. Four stations are proposed for Phase II: Alum Rock/28th Street, Downtown San Jose, Diridon, and Santa Clara. In 2035, the average weekday ridership is forecast to be 52,000. Sustaining Silicon Valley’s economic vitality is key to maintaining the leadership of the United States in many key global industries. Besides being the nation’s center of computer-related technology services, the region includes major concentrations of biotechnology, bioengineering, and renewable energy firms. It is the venture capital center of the world for private investing in these and other promising industries. The Valley, however, faces several challenges that could constrain its continued expansion. One is the efficient movement of goods and people to, from, and within the Valley as a result of historical low density land use developments with the automobile as the primary mode of travel. Various existing deficiencies in the regional transportation network are contributing to the worsening mobility. These include severely congested roadways that slow travel speeds to barely tolerable levels and gaps in public transit systems that discourage individuals from shifting out of their autos to higher-capacity trains and buses. The growing transportation needs of businesses and residents have prompted VTA to pursue various transportation improvements, with a strong focus on transit infrastructure given the reality that no new expressway or freeway corridors are included in the regional transportation plan due to environmental and public policy concerns. BART currently provides high-speed, high-capacity, heavy rail service within four counties of the San Francisco Bay Area and connects three of the region's four largest cities: San Francisco, Oakland, and Fremont. The extension will provide service to the Bay Area's and northern California's largest city, San Jose, the “Capital of Silicon Valley.” The full extension will complete a major link in a regional commuter rail network that will circle the San Francisco Bay (refer to Regional Map). Regional connectivity is important to the future of Silicon Valley, the high-technology center of the nation. Both Santa Clara County and the project corridor are anticipated to continue their remarkable growth well into the future. Regional projections by the Association of Bay Area Governments (ABAG) indicate that in the 30-year period from 2015 to 2035, the county’s population will increase by approximately 555,300 people, while households will increase by 256,600, and the county will see jobs increase by 191,500. Project corridor population, from 2005 to 2035, is projected to increase by approximately 91,000 people, households by 27,000, and jobs by 84,000. Jobs will grow faster than households, exacerbating the jobs-housing imbalance and the need for workers to commute longer distances. The project corridor connects San Francisco Bay Area's heavily-urbanized East Bay with the equally-populated South Bay. Development in the East Bay, including Fremont (population 228,700) and Milpitas (population 73,600) is constrained geographically by the San Francisco Bay on the west and Diablo foothills on the east. Development in the South Bay extends the width of Santa Clara Valley. San Jose (population 1.016 million) occupies the east and central portion of the Valley, which is in Santa Clara County (population 1,895 million). The area from north San Jose into southern San Mateo County on the west side of San Francisco Bay is the heart of Silicon Valley, although as a result of continuing growth over the last 20 years, Silicon Valley has expanded to include Milpitas and southern Alameda County, which are served directly by VTA’s BART Silicon Valley. Improve public transit service in this corridor by providing increased transit capacity and faster, convenient access to and from major Santa Clara County employment and activity centers for corridor residents and populations throughout the Bay Area and from communities that can access the BART regional rail network. Santa Clara County residents will be provided improved access to employment and activity centers in Alameda, Contra Costa, and San Francisco counties, including the Bay Area’s major employment concentration in downtown San Francisco. Enhance regional connectivity by expanding and interconnecting BART rapid transit service with VTA light rail, Amtrak, ACE, Caltrain, and VTA bus services in Santa Clara County; improve intermodal transit hubs where rail, bus, auto, bicycle, and pedestrian links meet. Support transportation solutions that will maintain the economic vitality and continuing development of Silicon Valley by expanding multimodal options and reducing reliance on single auto commute trips. Increasing the use of transit is critical to moving workers through highly congested travel corridors that serve major employment centers. Improve mobility options to employment, education, medical, and retail centers for corridor residents, in particular low-income, youth, elderly, disabled, and ethnic minority populations. Support local and regional land use plans and facilitate efforts of the Cities of San Jose and Santa Clara to direct business and residential investments in the Alum Rock neighborhood of east-central San Jose, downtown San Jose, Diridon Station, in the vicinity of the existing Santa Clara Caltrain Station, and elsewhere in the BART Extension alignment. Provide another catalyst to changing the patterns of development in Silicon Valley. Higher density employment and residential growth are occurring in the vicinity of existing and planned transit facilities. BART stations and the connection to VTA light rail in northern Santa Clara County offer the most promising opportunities for transit-oriented development on a large scale. VTA began studying the project corridor nearly 30 years ago. Back then, the corridor was referred to as the Fremont-South Bay Corridor and consisted of the heavily congested I-880/I-680 freeway corridor that stretches from the Fremont Bay Area Rapid Transit (BART) Station to downtown San Jose, which is located at the southern end of San Francisco Bay (see BART Silicon Valley Regional Map). Also, located in the middle of the two freeways was a Union Pacific Railroad freight rail right-of-way that would later be purchased by VTA. VTA’s BART Silicon Valley program represents the final link needed to complete the 20-mile gap in the regional rail system around San Francisco Bay and tie together the region’s three major metropolitan centers: San Jose, San Francisco, and Oakland. In November 2000, the voters of Santa Clara County—by a 70.3 percent majority—approved the Measure A Transit Improvement Program, a ½-cent local-transit sales tax that would provide funding for 14 transit projects, including the concept to extend BART to the cities of Milpitas, San Jose, and Santa Clara. This 30-year local sales tax went into effect on April 1, 2006 and will expire on March 31, 2036. Measure A is a capital funding source for VTA’s BART Silicon Valley. Opportunities for transit-oriented development in conjunction with local land-use planning efforts. This particular BART alternative also had the highest ridership projections. The ridership forecast for the project is over 90,000 average weekday riders throughout the 20-year planning horizon. In an effort to begin project delivery activities for the transit projects that were identified in Measure A prior to the 2006 tax revenue generation date, the VTA Board of Directors adopted a resolution in August 2003 authorizing the issuance of bonds up to $550 million secured by and payable from the 2000 Measure A Transit Improvement Program. A portion of these bond proceeds was made available to continue project development work related to moving VTA’s BART Silicon Valley forward. In November 2008, an additional Santa Clara County ballot measure supporting the BART extension passed, receiving 66.78% of the vote, exceeding the two-thirds super majority. The 30-year eighth-cent Measure B sales tax will generate dedicated revenue to fulfill VTA's obligation to BART for the operation, maintenance, and future capital reserve of the extension VTA constructs. 2008 Measure B stipulated that collection of the eighth-cent sales tax begin when federal and state funds were secured. Federal funds were considered secured and matched at the time VTA received a $900 million Full Funding Grant Agreement in March 2012. Collection of the eighth-cent sales tax began on July 1, 2012. In June 2016, the VTA Board of Directors unanimously adopted the framework and funding amounts to place an additional ½-cent 30-year sales tax measure on the November 8, 2016 ballot to help fund transportation priorities. An extensive 18-month public outreach process gathered input and suggestions on how to best improve the transportation needs of Santa Clara County. Through this process, a list of categories and transportation projects was approved, including a plan to invest $1.5 billion in Phase II of the BART Silicon Valley Extension. Measure B, which required a two thirds majority vote, was approved by voters by more than 71 percent of the vote and became effective in April 2017. Copyright © 2019 Santa Clara Valley Transportation Authority (VTA). All rights reserved.